At the invitation of Special Representative of China on the China-India Boundary Question and State Councilor and Foreign Minister Wang Yi, Special Representative of India and National Security Advisor of India Shri Ajit Doval will come to China for the 21st Meeting of the Special Representatives of China and India on the Boundary Question on November 23 to 24. Q: According to reports, on November 20, under the witness of the two state leaders, China and the Philippines signed an inter-governmental memorandum of understanding (MOU) on oil and gas development. Could you tell us more about it? A: The signing of this MOU between China and the Philippines signals a new step forward by the two sides in joint oil and gas exploration and development. The two sides will continue with further discussions on relevant specific issues. China looks forward to advancing the maritime practical cooperation between the two sides in an all-round way and reaping harvests at an early date to benefit the two countries and peoples. 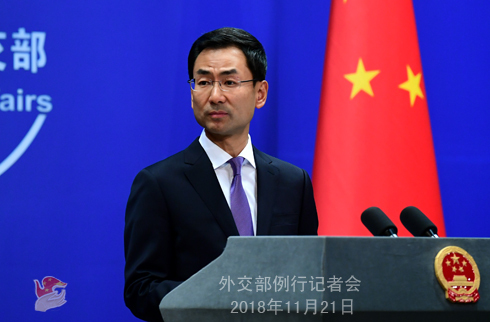 In the meantime, China also looks forward to strengthening communication with other littoral countries of the South China Sea on such cooperation so as to make the South China Sea a sea of peace, friendship and cooperation. Q: A China-US question. The US Trade Representative said yesterday that China has failed to alter its unfair and unreasonable trade practices. Is this criticism unfair as far as China is concerned? This White Paper gives very detailed and authoritative description and response to China's IPR protection and the so-called issues of China stealing the US technology and forced technological transfer. I won't go into details, but I suggest you and the US side as well give it a careful reading. I want to reiterate that the China-US economic and trade cooperation is in its nature for mutual benefit and win-win results. It is quite normal to have economic and trade frictions. The key is to resolve them through dialogue and consultation on the basis of mutual respect, equality and good faith. Q: Some new satellite images have been published by a US think tank showing that China is doing new construction work on Langhua Jiao, in the Xisha Islands. Do you have any information about what this new construction work involves? A: The Xisha Islands is China's territory without any dispute. China's construction on its own territory is beyond reproach. I'm not aware of the specific situation you just mentioned. Q: Firstly, you just announced the 21st Meeting of the Special Representatives of China and India on the Boundary Question. Where exactly are these talks going to be held? Secondly, this is the 21st round of border talks. Skeptics argue that not much progress has been made in border talks. How does China view the progress made so far between the two countries on this particular issue? A: I will take your specific question first. This meeting will be held in Chengdu, Sichuan Province. As for the Meeting of the Special Representatives of China and India on the Boundary Question, since the start of this year, under the strategic guidance of the two state leaders, China-India relations have demonstrated a sound momentum of development. Exchanges and cooperation in various fields have been deepening. The two sides have maintained close communication and coordination on boundary-related affairs and properly controlled disputes through dialogues and consultations. Thus, the border areas of the two countries remain generally stable. Both China and India attach great importance to this meeting as it is the first one since State Councilor and Foreign Minister Wang Yi took up the post of the Special Representative. The two Special Representatives will follow the guidance of the consensus reached by the two state leaders to have an in-depth exchange of views on the boundary question and actively move forward negotiations based on the outcomes already achieved and with the long-term interests of bilateral relations and the wellbeing of the two peoples in mind so as to properly manage boundary disputes and ensure peace and tranquility in the border areas. The two sides will also exchange views on major topics of China-India relations and international and regional issues of mutual interest. Q: The ROK government said today that it has decided to dissolve a foundation set up according to a bilateral agreement with Japan to settle the issue of "comfort women". Many believe that this will raise tensions again between Japan and the ROK. What is your comment? A: China's position on the issue of "comfort women" is consistent and clear. We hope that the Japanese side could take seriously the concerns of its Asian neighbors and the international community and properly and responsibly deal with relevant issues. Japan and the ROK are important countries in Northeast Asia. We hope that the two sides could maintain friendly relations. Q: Yesterday, at the 23rd session of the Conference of the States Parties to the Convention on the Prohibition of Chemical Weapons (CWC), the draft decision proposed by China and Russia to establish a working group to assess the legality of expanding the OPCW's mandate was not adopted. What is your comment? A: The Special Session of the Conference of States Parties (CSP) to the Chemical Weapons Convention (CWC) in June voted to adopt a decision on addressing the threat from chemical weapons use. But this decision was not supported by the vast majority of State Parties. 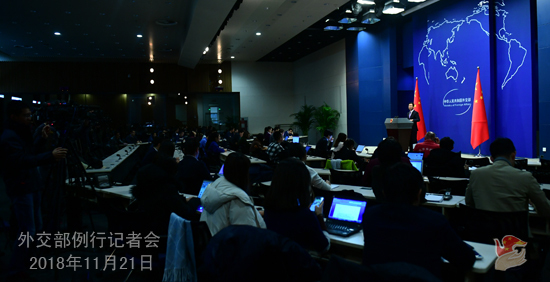 Many of them raised concerns on the legal basis, function and mandate, working methods, and personnel allocation of the establishment of a new attribution mechanism in that decision. China believes that the implementation of that decision will exert huge impact on the CWC, and all States Parties and the OPCW decision-making body need to take necessary methods to ensure that the relevant work conforms to the CWC provisions. In the principle of taking a forward-looking approach and following a consultation between China and Russia, the two sides jointly submitted the draft decision "safeguarding the OPCW unity" which suggests setting up an open-ended working group to assess whether the implementation of the decision by the June Special Session of the CSP meets the requirement of the CWC. 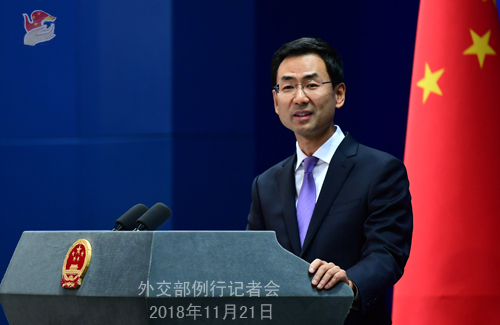 China believes that it is important to ensure that the decision will be implemented in accordance with the CWC and its verification annex, as this will help all parties properly resolve their disputes at the Special Session of the CSP. That will thus help the Technical Secretariat go about the relevant implementation work. We hope that all parties could continue to bridge differences through consultations, uphold the authority and effectiveness of the CWC, and safeguard the unity of the OPCW.